A Full Sea holiday at Riviera Spineta. 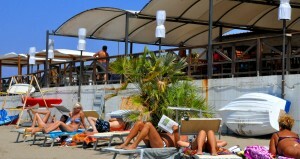 The Riviera Spineta is located right in the middle of the sandy beach of the South Coast of Salerno. A long stretch of beach where you can find an answer to yourneeds. We provide rescue services and cleaning but also two dining and drinkink points, sun umbrellas and gazebo to enjoy a larger private area. Spaces to have fun and to be safe. The beach is very large and offers to everyone opportunity to carve out a quiet corner in which to talk or have fun in the company of friends or with the guys that animation, those who want to spend peaceful hours in joy. The Animation square is the place dedicated to fun without bothering those who want to enjoy the tranquility, games, dances and parties in the evening to enjoy to the full the summer weather. A supervised swimming pool for children helps them to have fun in safety by ensuring that children (but especially mothers) spend hours of leisure and happiness. For more energetic pepople there is a great area for beach volleyball and beach tennis: the Spineta Beach Stadium. Managed in partnership with the Beach Volley Battipaglia and Summer Beach asd this is the main specialization of the Riviera Spineta from many years and it is a local reference point for summer sports. The tournaments organized during the the summer are a appointment for many fans. Just get out from the entrance on the garden to find themselves facing the sea. In fact, only few steps separate the hotel from the sea, ideal for all those who wish to forget the stress of everyday life. Beach sea and relax! 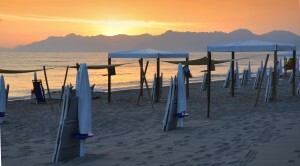 Book now your beach holidays in Italy and save 20% off se our price list! The offer is valid for all periods except the high season (August 3 to 23) and for all reservations that will be completed before 15th may. Continue to visit or website we will publish new special packages more affordable as soon as possible!